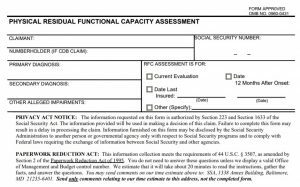 If you have limitations as a result of your disability, a Residual Functional Capacity Form (RFC) will determine the maximum amount of work you can do. This form references physical limitations and mental limitations on a capacity of a person to work. The RFC form will reference physical limitations such as how long a person can walk, sit, stand etc. and mental limitations such as how a person would adjust to a work environment if they have bad memory, do not think rationally, etc. 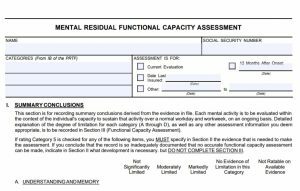 The RFC form is filled out by the treating psychiatrist or physician and reviewed by a DDS examiner. The DDS examiner will evaluate your file to assess the medical evidence. The benefit of having your own personal doctor complete the form is that they are often much better suited to know how your condition will affect your ability to return to work. In general, one’s medical records are written in a straightforward way to describe pain but not necessarily to record one’s symptoms which makes a personal physician or psychiatrist’s advice more relevant. The process of applying for disability can take time, so give your doctor enough time to fill out the form. Inform your doctor as early as possible that you would like them to fill out the form. It is advisable that you request your doctor to fill out the form as early in the application as possible to ensure that the process goes smoothly and quickly.